Springsteen & I is a unique feature music documentary celebrating a rock n roll icon: Bruce Springsteen. Working with the filmmakers, Springsteen's fans have helped create a film that reflects on their personal insights and experiences to explore what this timeless artist means to them. Their stories are at times touching, at times humorous, at times extraordinary and they all come from the heart. 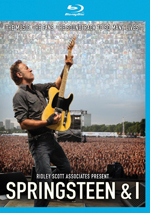 Combined with previously unseen archive footage of performances throughout Springsteen's career, this is a film by the fans and for the fans created with the full support of Bruce Springsteen. After 40 years as a recording artist, Bruce Springsteen has established one of the most dedicated fan bases in all of rock. 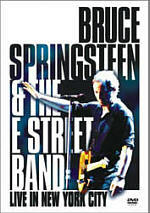 Those fans become the focus of 2013’s Springsteen and I, a look at what Bruce means to those who follow his work. Though it also includes concert footage of Springsteen from over the years, the project usually consists of fan-created video submissions. In these, folks discuss what they think of Bruce and aspects of their lives and histories as fans. Obviously that means Springsteen doesn’t follow any form of narrative arc. Though the editing doesn’t present the comments in a random order, there’s no abundantly obvious pattern on display. Some fans give us emotional testimonials while others go for more comedic – or kooky – bents. As the veteran of many, many Springsteen shows, I am a Bruce fan, and I’ve spent ample time around others with a deep interest in his music. While it pains me to say this, I must: diehard Bruce fans tend to be pretty annoying. Many indulge in endless one-upmanship and bring an odd level of competition to the subject. If you saw Bruce in 1978, someone will say they saw him in 1977. If you’ve been to 200 Bruce shows, the next guy will claim he went to 201. Sometimes I honestly start to wonder if some of these folks really care about the music or if they’re just in it for the “sport” of it all. When I saw Bruce at a small show in Pittsburgh in 2011, the people behind me engaged in pretty relentless genital-comparing – and continued well into the start of the concert! Perhaps this sense of competition comes with other acts who attract diehard audiences, but I’m not sure. I’ve been to many Pearl Jam fans and have hung out with their “major fans” but never experienced the same attitude I get from Bruce buffs. PJ fans seem to be there for the music and they appear to be happy to embrace anyone else who wants to come along for the ride, whereas Bruce folks often judge others based on their “Springsteen credentials”. None of this keeps me from enjoying the concerts, of course, but I must admit I just don’t often like to hobnob with other Bruce fans. Going into Springsteen and I, I hoped that I might get a broader perspective on those other Bruce fans and come to appreciate them from a different point of view. Alas, that didn’t happen; while it usually shows that Bruce attracts listeners without quite the same “trainspotting-style” obsession that I seem to encounter, it doesn’t show Springsteen fans in the most fascinating light. Honestly, as I watched the documentary, I wondered if it included each and every video submission the producers received, as I couldn’t imagine it represented the cream of the crop. It does try to avoid the genital-comparers, though a few do appear, such as the slightly frightening woman who makes sure we know that if you didn’t see Bruce before she did, you missed out on his “ferocity”. Where’s that “roll-eyes” emoticon when you need it? A few other semi-creepy folks pop up as well, like the guy who starts to cry when he just thinks about the lyrics to Bruce songs – he doesn’t even need to hear them! I guess we’re supposed to be moved by his emotional attachment to Bruce’s lyrics, but instead, he just seems weird. To balance out these oddballs, we do get a few genuinely interesting tales. I like the guy who got on-stage in Philly while dressed as Elvis – and sang a couple of tunes with Bruce. A couple of the others seem like nice enough people who have decent stories to tell. But most are eminently forgettable, which leads me to the “this is the best they had?” feeling. And the answer is “apparently not”, as the Blu-ray includes some “bonus films” that I like more than anything in the final product. So why do we end up with so many banal tales? I don’t know. Of course, I have no idea if the interesting “bonus films” found here offer all the good material in the vault or if they held onto other worthwhile footage, but I do believe that much of the program passes with lackluster commentary. The fans relate experiences and feelings that rise above the level of “Bruce rules!” but not by much; that largely sums up the program. 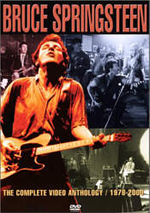 Though not a creation of Springsteen’s camp, the documentary usually feels like his folks spearheaded it, as you’ll get an awful lot of praise for Bruce here. Granted, that’s inevitable to a certain degree – after all, the show’s about fans and their feelings toward Springsteen – but I would’ve liked something a little less smooochy-smoochy. At least Springsteen and I throws in some good archival footage of Bruce on stage. As I’ll mention soon, the quality of the material varies wildly and is often pretty weak, but I’m still happy to see it. We get gems like an acoustic “Growin’ Up” from the mid-70s as well as a few other performances from across the years. We don’t get full songs, unfortunately, which makes them less useful, but I still enjoy them. Actually, we find one complete song at the end, when we hear “Born to Run” in its entirety – with a twist. The movie edits together a montage of renditions that starts in 1975 and finishes in 2012. It’s a fun way to catalog Bruce’s performances of his most iconic song over the decades. The live footage was enough to get me through Springsteen and I, but the rest became tough sledding. I’m sure one can find fans with interesting tales to tell of their Bruce-related experiences, but few of them appear in this tedious documentary. 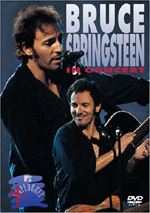 Springsteen and I appears in an aspect ratio of approximately 1.78:1 on this Blu-ray Disc. Though it came from a mix of sources, the visuals usually looked pretty good. The film combines fan-shot video with archival clips, and the latter tended to look the worst. Even when the film opted for professional footage – like the “Dancing in the Dark” video – the results appeared pretty rough, and when we got older clips, those were fairly messy. A few were decent, but most came with a mix of visual problems. Inevitably, the fan-shot material also presented ups and downs, but thanks to the ready availability of decent digital video from smartphones, most looked surprisingly good. A few came from subpar sources like webcams, but the majority offered pretty nice visuals. Most of the movie seemed reasonably concise and accurate, with natural colors and generally positive reproduction. I wouldn’t use this as demo material, but the results became much more appealing than I expected. Unfortunately, the DTS-HD MA 5.1 soundtrack of Springsteen and I worked less well, though not due to the fan-shot segments, which were usually fine. They came with limited soundscapes and were often essentially monaural, but that seemed appropriate and suited the chatty material. It was the music that offered the less impressive material – much of the time, at least. Occasionally we got reasonable quality music, but many of those elements sounded rough and messy. They rarely presented good stereo imaging and instead used the speakers in a blobby, amorphous way without clean imaging. Perplexing mismatches between visuals and audio occurred along the way. For instance, a 2012 version of “I’m Goin’ Down” clearly came from pro-shot sources, but the audio appeared to stem from an audience recording, so the terrific visuals didn’t connect with the tinny sound. Given the usual reliance on fan comments, the auditory flaws didn’t become a big concern, but it did seem weird to get a music-related program with music that often sounded pretty weak. When we shift to extras, the main attraction comes from six bonus tracks. These songs come from Springsteen’s 2012 London “Hard Rock Calling” concert, and we find “Thunder Road”, “Because the Night”, “Shackled and Drawn”, “We Are Alive”, “I Saw Her Standing There” (mislabeled “When I Saw Her Standing There”), and “Twist and Shout”. Paul McCartney guests for the last two. In total, these six songs fill 35 minutes, three seconds, and they’re the reason Springsteen and I will remain in my collection. The main program does little for me, but unless Bruce releases a full version of the 2012 show, I’ll want to have the Blu-ray to retain these renditions. They look great and sound pretty good, so they’re nearly worth the price of admission on their own. We get an additional four Fan Submissions as well. This area includes “Rogerio’s Film” (3:00), “Dreams” (2:33), “Murakami’s Film” (5:07) and “Minami’s Film” (6:41). The first two are fairly amusing and should’ve been in the final movie; they’re much better than most of the material that made the cut. “Murakami’s Film” is dull, as it just shows a guy who jogs accompanied by “Born to Run”, while “Minami’s” offers a woman’s spoken comments in Japanese along with handwritten text; it’s mildly interesting at best. Finally, Meet the Fans goes for 10 minutes, 52 seconds and offers a post-script. We see a few of the folks featured in the movie and watch as they chat with Bruce after a show. It doesn’t do a lot for me, but I guess it offers a nice follow-up encounter. Springsteen and I attempts to shed light on the relationship between Bruce Springsteen and his fans, but instead, it tends to be dull and tedious. Though a few good stories appear – and we find some nice concert footage – much of the program feels forgettable. The Blu-ray mixes pretty positive visuals with ordinary audio and a handful of bonus features led by some live performances. If Springsteen fans have rich tales to tell, they must have kept them to themselves, as we find little of interest here.